1. Preheat broiler. 2. Place bagel halves, cut sides up, on a baking sheet. Broil 2 minutes or until lightly toasted. 3. Spread 2 tablespoons marinara on cut side of each bagel half. Top each half with 1/4 cup chicken, and sprinkle with 1/4 cup cheese. 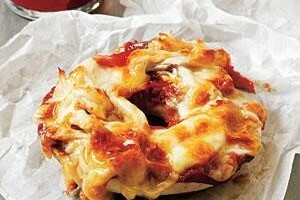 Broil bagel halves an additional 2 minutes or until cheese melts.